Aloha. Welcome to a little slice of paradise. Enjoy the view and relax in secure, peaceful surroundings. This lovely loft style condo is located in the most central location to all points of interest that a traveler would want to explore. Featuring an open floor plan with modern appliances and tropical decor. Recently remodeled kitchen, flooring, painted with other nice upgrades. Property managers (I Go Maui Vacation Rentals & Realty) boast to provide a very clean, comfortable, well stocked and maintained accommodation. The goal is for you to arrive happy and leave happier. Kids love touching and seeing ocean critters at the Maui Ocean Center. One of the islands top attractions it is located about 150 yards away near Maalaea Harbor. Casual to fine dining is available just a short walk to the shops at Maalaea Village. If dining out is your preference, Maalaea Harbor offers Beach Bums -a funky casual harbor side restaurant famous for their pulled pork and happy hour live music. Sandwich and ice cream shops are sprinkled between boutiques and souvenir shops. Walking distance to Tradewinds Deli and for delicious meatball sandwiches yummy fresh made deli sandwiches and those forgotten items like milk, bread and spirits. Tradewinds Deli also carries local fruits and produce so ask when it is scheduled. The General Store/restuarant features bakery goods, espresso, breakfast and lunch items as well as a great place to get some lite grocery shopping done. Located across from the Coast Guard station in Maalaea Harbor. Walk among the waves at a secluded beach less than 1/4 mile away. If you prefer a romantic walk along the sand... a few steps beyond the public beach access is a stretch of Sugar Beach next to a bird sanctuary. An (approx) 5 mile stretch of solitude offers a great backdrop for your morning jog or a sunset stroll.Oceanfront: Great view of Humpback whales frolicking with their calves in Maalaea Bay during whale season. Fantastic Location! This Condo is centrally located in a great location right near the harbor which turned out to be super convenient. I surprised my wife with a Sunset dinner cruise (very nice!) and I saw they offered whale watching and fishing trips, too. It was really close to shopping, beaches and the infamous Road to Hana if you decide to go there -- I wasn't a fan: take your dramamine, first! The condo was stocked with a couple of beach chairs, plenty of nice beach towels, and a cooler which was really nice. On our last night I decided to BBQ a great steak we picked up at COSCO and we happened to catch the turtles swimming on the reef at sunset. It was a nice final night to a rejuvenating experience. We were two couples and space was fine. Kitchen was well stocked and all really clean. Anything we needed extra or tips and information and Andreas helped us out! You will love this condo - professionally maintained with an unbelievable view! My family and I really enjoyed this condo at Maalaea, Maui. 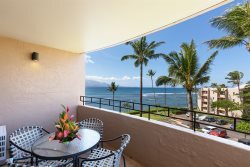 The ocean view is spectacular with Haleakala position in the back drop past the ocean. The moon at night between the palm trees look just like the Corona commercial and you there are Sea Turtles swimming along the break wall. This condo is professionally maintained everything was in great condition, clean, and operable. The extra effort with the welcome touches were much appreciated. This unit is well stocked with not only essentials but, it has coolers, beach chairs, beach towels, and a bunch of other incidentals that make your stay fabulous. Great communication during planning, FAQ, and with the local contact made getting into the condo super easy. This unit has been updated with comfortable furniture and you will not believe the truly amazing view. We made use of the well maintained grills several times, enjoyed the warm pool, and met a number of friendly folks who were staying on site. Tip: Rental a car so you have convenient access to all of Maui attractions, beaches and shopping. There is a harbor just a quick 5 minutes walk from the condo. We enjoyed the bar and restaurant, aquarium, and put-put course which were all within a short walk. The loft style master and second bedroom was super cool coldest AC on the island! We really enjoyed our time in this unit and would come back and stay here again. Spacious apartment for holiday fun. This centrally located apartment was great for family stay. Good kitchen fully equipped, great views of the sea and south. We found a great beach just south with parking shade and toilets safe for our 4 year old and us to SUP. Quite area so dont expect a night life on your door step. Clean, good view, quiet, well stocked condo. Liked the beach chairs, towels and coolers. This made going to the beach much better. Pictures represent the condo condition. Condo was well stocked in the kitchen with plenty of cooking/baking pans and utensils. The AC in the bedrooms was great to remove the humidity making for a more comfortable sleep at night. Location was central in the island and great to see the different parts. The beach right down the road was very good. We drove there so we could take the chairs, cooler, towels, etc... rather than carrying all the stuff. Not many people there and nice sand. Good customer service with the rental management company. They contacted us prior to our vacation to confirm, the day we arrived he called to make sure all was good and left his number if we needed anything. I would definitely consider this condo and rental company again. Our little daughter loved running up and down the stairs and playing in the loft. Thanks for making our stay great. Mahalo. Great stay in Maalaea We had a wonderful stay from Mar 18-27. We loved the condo, with the loft, separate room for the kids, full kitchen, and beautiful views from the lanai. We really appreciated the extra amenities like beach chairs, boogie board, beach towels, and cooler. We definitely used all of those items. We especially enjoyed how central to all of Maui this area is. We could go on day trips all over the island and really take in the sights. We did the Hwy to Hana, watched surfers at Hookipa Beach, snorkeled at various beaches in south Maui, explored Lahaina, and west Maui too. Highly recommend this property as a home base for your island adventure! Great Property! Love Our Time There! Well cared for and responsive staff. Great Vacation Stop! This unit is strategically located to give privacy and yet close enough to just about any venue on the Island. The unit is provides everything needed to have a nice relaxing time from the moment you arrive. It was clean beyond expectation, air conditioned, and supplied with the essentials required for the stay. The facilities were well maintained and well kept, including the common BBQ area and lawns surrounding the facility. With assigned parking and an elevator made moving in and out a breeze. The pool is large enough and deep enough to allow either nice refreshing dip or for those who want to do laps. And, as you enjoy the pool or sit on the well furnished balcony you can see and hear the waves lapping up the rocks or hitting the retaining wall a few steps away. It was hard to leave this place and would certainly return. As a extra. Andres and Stephanie were there from the time we booked with either welcoming phone calls and e-mails or checking in to ensure we had everything we needed. Thank you to both of you. Great Property In Central Location! This place is a great value. Stayed here with my pregnant wife and our 1 year old. Location was in the middle of everything on Maui and the apartment was well stocked. Not just with cooking utensils and toiletries, but also with beach chairs, umbrellas and boogie boards. The pool is nice and although there is not a beach below, there is quite a nice one just 5 minutes walk from the place. You will need a car to stay here as most everything you will want to do is a short drive away. While there AC was on when we arrived, so we know it works, we shut it off and didn't need it the entire trip. A nice breeze blows through the apartment when you open the windows. Sparkling Oceanfront Condo Restful Evening Retreat! Hale Malolo was everything advertised and more. Condo was beyond clean. The modern kitchen was well stocked. The evening was quiet and peaceful, no street noise, just lapping of ocean waves. We awoke to see turtles bobbing about on the reef. After days playing golf or hiking, we were happy to have AC and a Mai Tai.. Happy memories created. Mahalo. NOTE: Shared Laundry Rooms No Longer Use Quarters But Now Require Credit, Debit Or Pre-Paid Cards. Clean, Spacious And Wonderfully Located Condo! We spent a week at this condo in August. The a/c was a real bonus during the hot days when we were in the condo. It was clean with comfy beds. Being within walking distance of the harbour made taking the Molokini tour wonderfully easy. Some great restaurants at the harbour made evening meals very easy. It is also practically right beside the Maui aquarium! The condo had a lovely pool where you can take in the ocean view while watching the kids swim. We watched the honu (turtles) right from the balcony every day! If you plan on doing laundry, remember to bring quarters! Amazing Family Retreat! It is tough to put into words how great the condo was. My wife and I along with our two little boys spent 8 nights in the condo. Each morning we would enjoy breakfast and coffee while watching the sunrise and the turtles swimming. One evening we did a steak BBQ on the gas grill near the pool. We also really appreciated the available beach toys (chairs, boogie boards, cooler). There was plenty of space for all 4 of us and we cannot wait to come back again soon. Perfect Condo, Centrally Located. Our stay was perfect - family of 4. The condo is well equipped with all the necessary amenities. Very clean, great ocean view. The property managers were excellent, great communication and instructions. Helpful as well. Would recommend and return to this unit. Exceeded Our Expectations! We couldn't have asked for a better place to stay. The view was amazing! The condo was clean and the property well maintained. It was quiet and peaceful, with the sound of waves crashing. The condo was equipped with everything we needed for the beach, and we used them everyday. We had coffee on the lanai every morning, and BBQ'ed by sunset at night.